Action Jackson: You Can't DO That On Television! The idea for the figure came from the company's founder, D. David Abrams, who also happened to be a New York Knicks fan. At the time, the so-called sixth man on the World Champion Knicks was Phil Jackson, who would later coach Michael Jordan and the Chicago Bulls to 5 NBA Championships. The New York press had given him a catchy nickname that David Abrams thought would make a good moniker for their new toy line. "Action Jackson" was born. "The biggest little man in the world of adventure" was clinging to life by 1973. The line encountered a near-fatal disaster the previous year. As it was their first foray into television, Mego hired Mel Hellitzer Advertising to create the television commercials for Mego's new line. Hellitzer was an industry hotshot at the time, and he produced a terrific series of spots for Action Jackson; Spots designed to put Mego on the map and attract a lot of attention. Unfortunately, they were immediately successful in attracting the attention of the National Association of Broadcasters. The television industry at the time was self-regulated by the NAB, which had certain guidelines policing content and claims made in commercials. Though we are by now used to seeing 3D Barbies skating and swimming and strutting down runways thanks to Reagan Era deregulation, the rules used to be much different. In the seventies, one of the cardinal rules of broadcasting was that toys and dolls could not be animated or otherwise presented doing things they did not actually do in reality. Of the spots Hellitzer produced, each one was almost entirely animated with stop-motion photography. Mego might have died at the starting gate, watching helplessly as the NAB pulled all of their ads from the airwaves, but they had managed to pre-sell enough product based on the first commercials to survive the blow. The calamity was averted with some quick thinking and a bold gamble. The Jungle house was featured in this 2 page spread to kick off the AJ section in 1973. See Jungle-House below for full image. 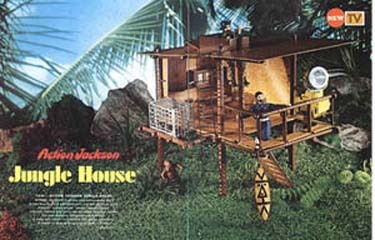 The Jungle House design would double in the same year as Dinah-Mite's Beach House and later as a Planet of the Apes playset. While Action Jackson and his outfits are still fairly plentiful, his accessories and playsets are quite rare. When the line was a disappointment, the huge inventory was sold off at fire-sale prices, mainly in Canada, and can be found in case-quantities to this day.